Typically Tim Burton-esque this film merges the fantastical with the real in a seamless and enjoyable mix. With a flair for the extraordinary and a step away from the Johnny Depp and Helena Bonham Carter films of years gone by, we see a new ensemble feature in a Burton film. Featuring a mix of well known names and new faces this film captures the imagination and a want to be Peculiar. Asa Butterfield as Jacob captures what it means to be a kid that doesn’t quite fit in, perfectly awkward and unsure about his social standing. He shares a great love for his Grandfather and upon finding him brutally murdered sets off to Wales to find out how true his stories really were. You might recognise Asa from such films as Hugo and The Boy in the Striped Pyjamas. The latter which showed the emotion he could carry into a film even at a younger age. Miss Peregrine is as eccentric as she is organised and Eva Green plays this character with enough authourity and intrigue that keeps the viewer glued and interested in every word that comes out. She is like the headteacher who knows all her students and assigns daily tasks that meet with their certain… peculiarities. It is always fantastic to see Samuel L. Jackson in any film, and this time is no different. Particularly creepy with white eyes he is imposing and sarcastic (when isn’t he?) a perfect blend of the horror of the night and the ones we see in the day, he manages to bring a real threat to the characters in the film. 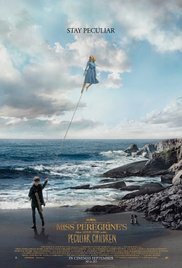 Overall i really enjoyed this film, it is visually stunning ans captures the tone of the scenes, be it eerie or full of wonder. The motifs of life and death are present throughout, unlike the blink and you’ll miss him Burton. Is it worth seeing? For sure. It may take a little while to get into the good stuff but the build up is all interesting. All the children have a story that is touched on and in someways it’s disappointing we didn’t get to learn more. A much improved film on Alice Through the Looking Glass and one that if you can, I would urge you to see.